URG Members: Now you can see what RAS is purchasing in addition to NHTSA recalls. 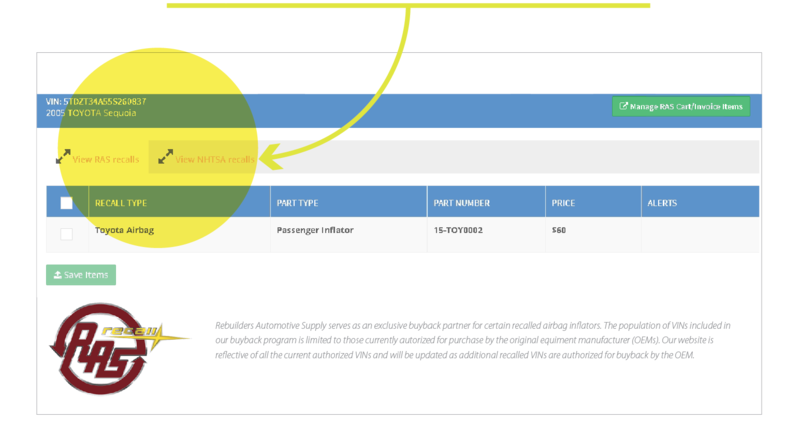 Use the Recall HotKey to add parts to the RAS CorePro website, manage your recalls, invoice out and print tags. From the search results screen or vehicle record, it will grab the VIN and show you if RAS is purchasing recalls, and if the NHTSA website has recalls for yards utilizing the Pinnacle Pro, Powerlink, Checkmate and Crush systems.